Karbonn mobiles has launched , Karbonn A9 star along with A8 , the latest entry level dual core smartphone . The device comes at very attractive price of RS 5699 . It runs on Android 4.0 ICS OS to make 3.9inch ( 480×800 pixels resolution ) capacitive touch screen display alive . It gains the power from 1GHZ Dual core processor paired with 512MB of RAM . The specs of the device are good at this price point . It comes with 5MP rear camera with FLASH and VGA front facing camera . It packs with 1500 mAH battery . The A9 Star offers 4GB ROM ( internal memory ) and expandable memory up to 32 GB via the use of SD card . The Karbonn Star A9 has Dual Sim support ( 3G + 2G ) . 3.9 inch display having WVGA resolution ( 480 x 800 pixels ) . 1GHZ 2 core processor , 512MB RAM . 4GB internal storage , 32GB expandable memory . 2G , 3G , WIFI , Bluetooth , GPS , GPRS 3.5mm audio jack . 5Mp primary camera with LED flash and VGA front facing with video call support . The A9 star will compete with Intex’ recently launched X4 , Y2 , Gionee Pioneer P2 , Xolo 500s and Micromax’s A74 , A63 canvas Fun . 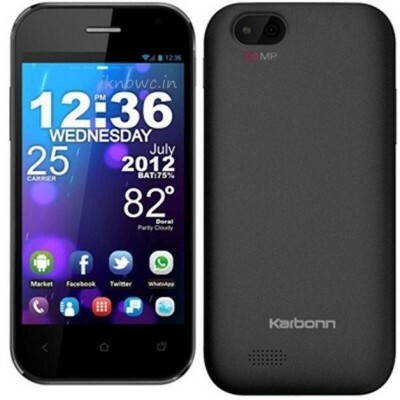 Karbonn A9 star is available for purchase from infibeam .